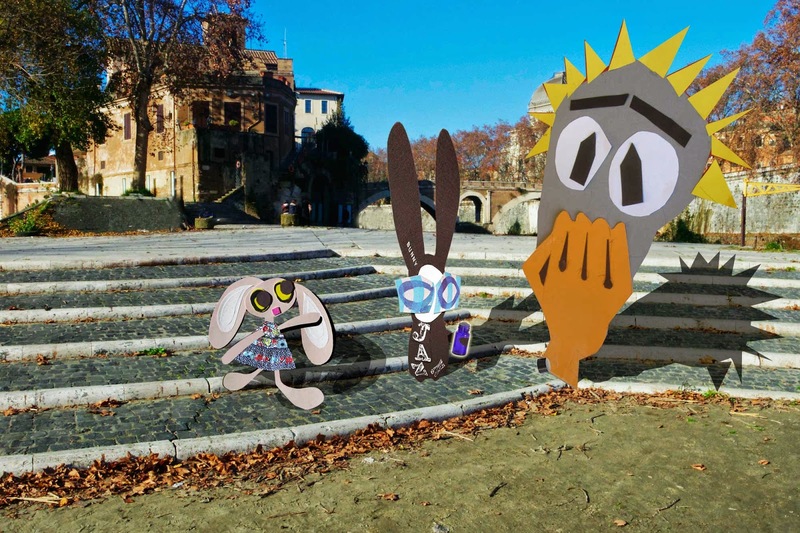 The Wabbit and Lapinette took Panico to an island in the river where no one would disturb them. The Wabbit wanted to secure Panico's vial and he gently persuaded Panico to let go. But as he grasped the vial, the cap flew off and the vial began to glow. The Wabbit couldn't help sniffing the faint puff of vapour which escaped. He felt a strange pleasantness and smiled calmly. "I don't know what all the fuss is about." Panico drew back in horror but Lapinette had seen this sort of thing before and knew the contents of the vial had gone straight to the Wabbit's ears. "What are you thinking?" she asked. The Wabbit considered. "I'm thinking of how much I know about everything." Lapinette's eyes were questions. "And what about time?" "There's seems to be an awful lot of it," shrugged the Wabbit. Lapinette silently agreed and waited patiently. Gradually the Wabbit shrank back to his normal size. "Phew," said the Wabbit. "I wouldn't like this to fall into the wrong ears." For the very first time, Lapinette saw Panico relax. "I thought your ears would grow until they poked a hole in the sky," he laughed. The Wabbit laughed too - but all the same he looked up and wondered. "Don't even think about it Wabbit," said Lapinette, "We have work to do." The Wabbit retrieved the cap and screwed the vial tightly shut. Then he tossed it back to Panico. "Aaagh!" shouted Panico. "You hang onto it," said the Wabbit. Panico was aghast. "What if the Agents of Rabit try to take it?" "Look 'em straight in the ears and drink the lot," grinned the Wabbit.